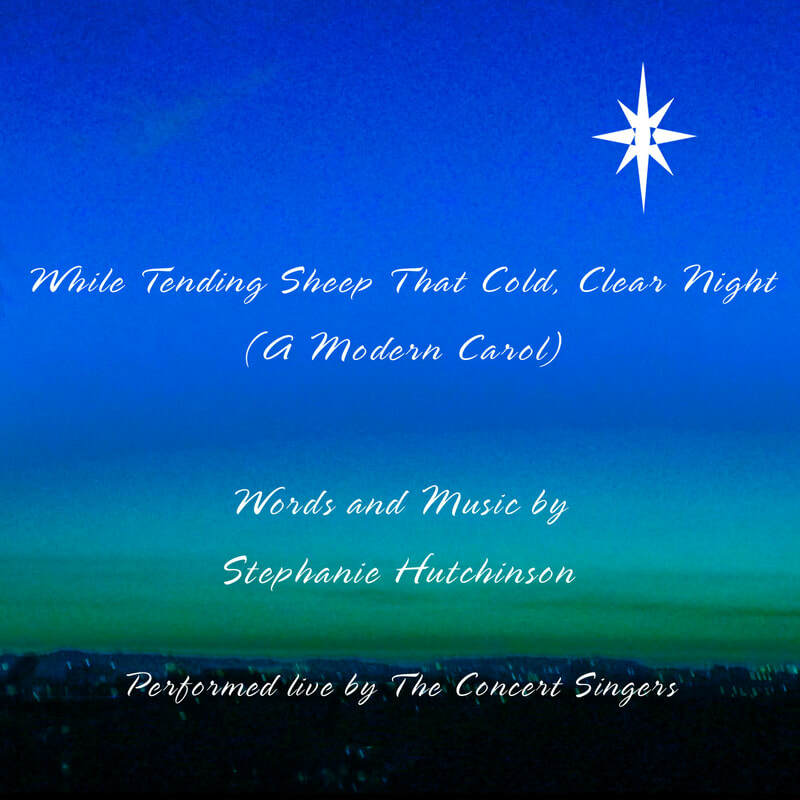 WHILE TENDING SHEEP THAT COLD, CLEAR NIGHT (A Modern Carol) was chosen by Morningstar Productions as the winner of their Christmas Songwriting Competition in December 2018. The composition is for SATB choir and can be performed either with piano accompaniment or a capella. The fourth verse descant can be done either by flute or a few sopranos. A video of The Concert Singers performing WHILE TENDING SHEEP THAT COLD, CLEAR NIGHT can be seen here. Digital downloads are available on Amazon and CD Baby. Items featuring the beautiful cover art (such ​as mugs and tote bags) are available on Zazzle. I've joined Patreon-it's a membership platform that makes it easy for artists and creators to get paid-please see the video! Thanks so much for your generosity! HALLELUJAH CHORUS II (Spoken Word for Choir and Drum) will have its World Premiere on Easter Sunday 2017 at Reformation Lutheran Church in Westminster, CA. The church commissioned me to compose a spoken-word Easter piece, similar to the one I did for Christmas (WONDERFUL COUNSELOR, THE PRINCE OF PEACE-see below). It's a 21st-century version of the classic "Hallelujah Chorus". The SATB choir will be joined by a djembe drum (played by yours truly) in this rhythmic, joyous piece. Written and directed by Dr. Stephanie Hutchinson, "The Birth of Christ: Prophetic Pronouncements and Angelic Announcements” is a four-part cantata featuring a spoken word choral piece, WONDERFUL COUNSELOR, THE PRINCE OF PEACE (think "Hamilton"), a script entitled "The Annunciation", featuring different languages spoken in the congregation, a piano solo, and an original choral composition, WHILE TENDING SHEEP THAT COLD, CLEAR NIGHT. Please join us as we prepare our hearts and minds to welcome Jesus Christ our Savior and Lord. WONDERFUL COUNSELOR, THE PRINCE OF PEACE--an SATB spoken word piece based on Isaiah 9:6 (it can even be called rap!). A contemporary takeoff on "For unto us a Child is born" from the Messiah. The world premiere will be Sunday, December 18th (9:00 a.m. service) at Reformation Lutheran Church, Westminster, CA. Reformation Lutheran in Westminster, CA has asked me to write a Christmas program for their December 18th service. What began as a music-only program has blossomed into a broader work, incorporating spoken word, foreign languages, etc.! LYRICAL MUGS, or MUGS WITH LYRICS! People tell me they really enjoy singing the lyrics of my congregational songs/hymns, so I was inspired to put the lyrics on products. I'm thrilled with the high quality and beautiful colors of these mugs! ​All these lyrics are set to original music and are available as sheet music. The mugs each feature one verse, so the whole lyric is spread out over three or four mugs, depending on the number of verses. 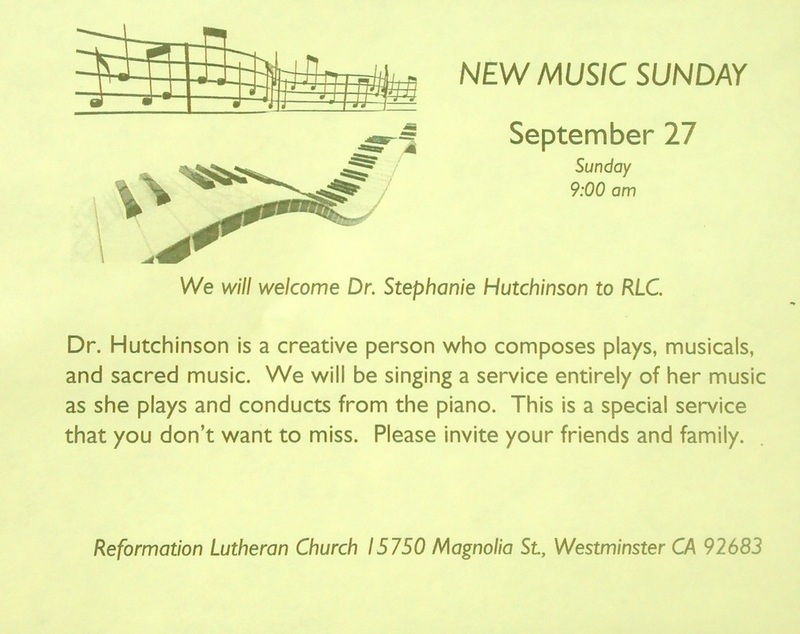 I'll be the guest musician at Reformation Lutheran, Westminster both this Sunday the 10th as well as on the 17th (9:00 a.m. services). Both services will consist entirely of my original music. ​All of this sheet music is available on the Store page, here. I am available to play/introduce my music to churches; please inquire here. WHILE TENDING SHEEP THAT COLD, CLEAR NIGHT (A Modern Carol) was heard on KPPC in San Antonio, TX in December. This live recording by The Concert Singers was conducted by Phil Theodorou. ​Digital downloads are available here. Scroll down to see a YouTube video. Merch featuring the beautiful cover artwork can be found here. Sheet music for these new songs and hymns will be available. I hope you can come, and look forward to greeting you after the service! ShepherdSong Music will have a book table at the upcoming NACM (National Association of Church Musicians) convention in Laguna Beach, CA on July 9-10. My original hymns, anthems, Christmas carols, responsive readings, musicals, plays and merch will be available for purchase. In addition, I will introduce my latest hymn, THE CROSS, THE BLOOD, THE RESURRECTION. Please see the Store page for information on these items. Three weeks after the World Premiere of THE CROSS, THE BLOOD, THE RESURRECTION, Covenant Presbyterian is singing it at again in their Sunday May 3rd service (details below). I will accompany on piano. on Sunday, April 12, 2015 in their 10:30 a.m. service. The hymn (original words and music) is appropriate from Easter Sunday on in the church year. It speaks of Jesus' Cross, Blood, Resurrection, and Ascension, as well as of His mercy and grace. The instrumental bridge is meant to evoke cascading handbells. I will be accompanying on piano. I look forward to greeting you after the service!